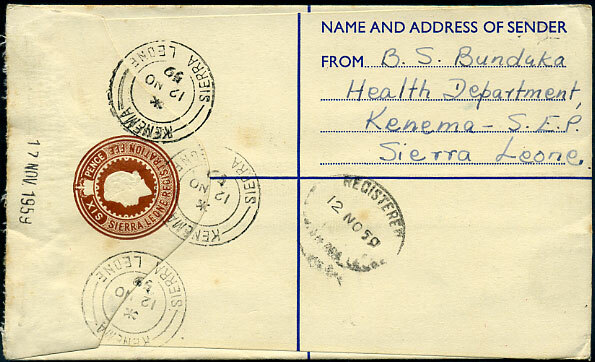 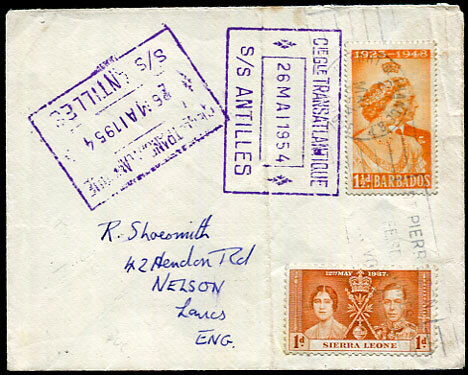 1997 (JU 17) large Bermuda Bible Society cover with 5c, 35c, $3.00 to Calaba Town, Wellington, Freetown, Sierra Leone with boxed "SERVICE SUSPENDED/RETURN TO SENDER" handstamp. 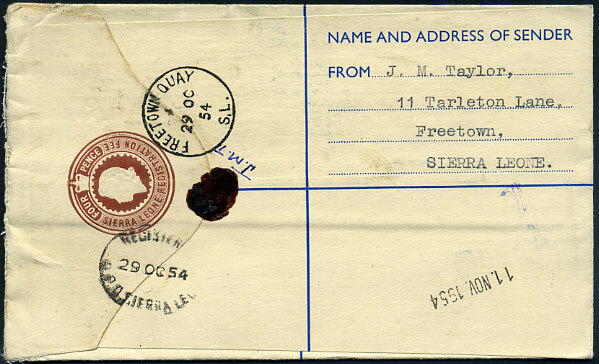 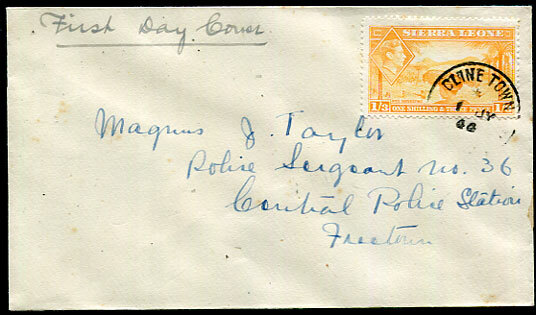 (025.03) */1 JY 46 tying KG6 1/3d (SG.196a) on First Day Cover to Magnus J. Taylor, Police Sergeant No.36, Central Police Station, Freetown. 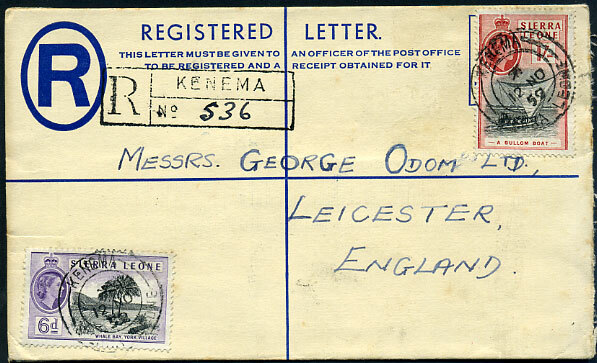 (072.07, long arcs) */12 NO 59 on QE2 6d PSRE with added QE2 6d, 1/- to Leicester, black KENEMA reg. 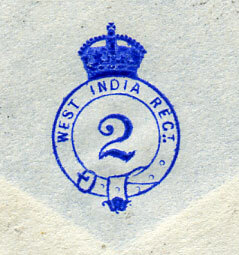 handstamp. 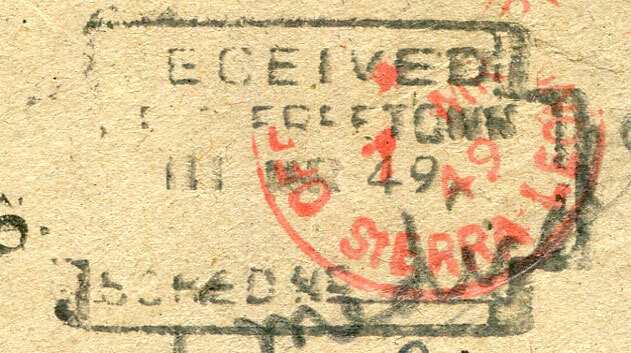 (147.01) rare code sideways up C/MR 11 11 (later than new Walton) on KE7 1d PSE pmk'd Freetown A/MR 7 11 to Deutsche Kamerun Gesellshaft, Sumbuyah. 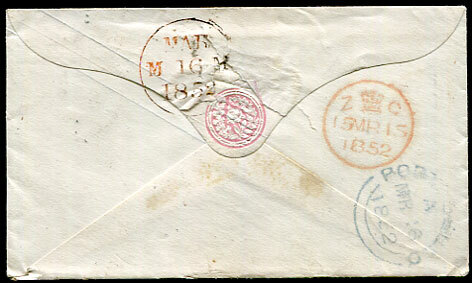 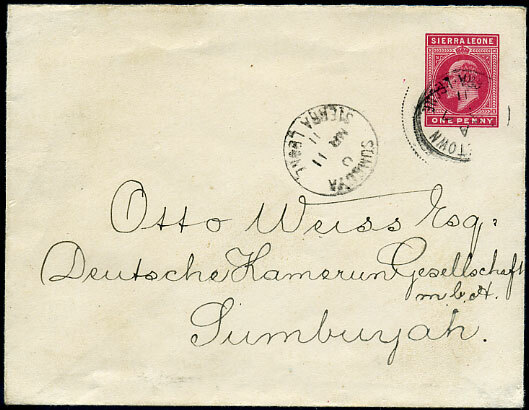 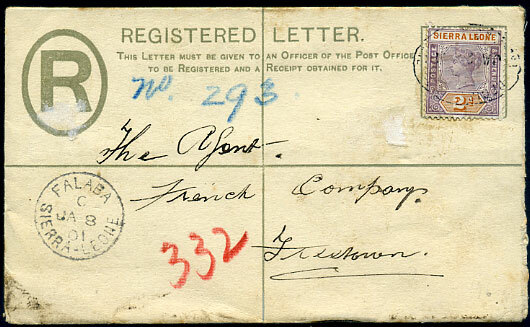 (073.02) C/AU 29 07 crisply doubled alongside KE7 1d (SG.87) pmk'd Freetown A/31 AU 07 on cover to Banbury, stamp with smaller faults. 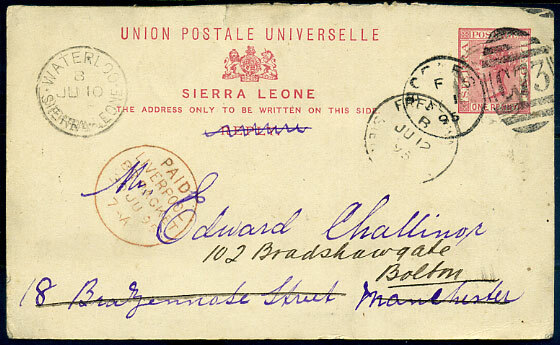 (033.01) dated C/JA 8 01 on face QV 2d PSRE with added QV 2d pmk'd REGISTERED oval A/JA 21 01 to the French Company, Freetown. 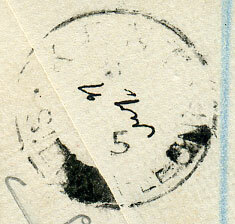 (716.02) alongside KG6 6d, 1/- tied REGISTERED G.P.O. 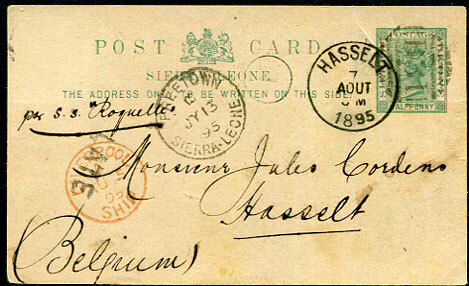 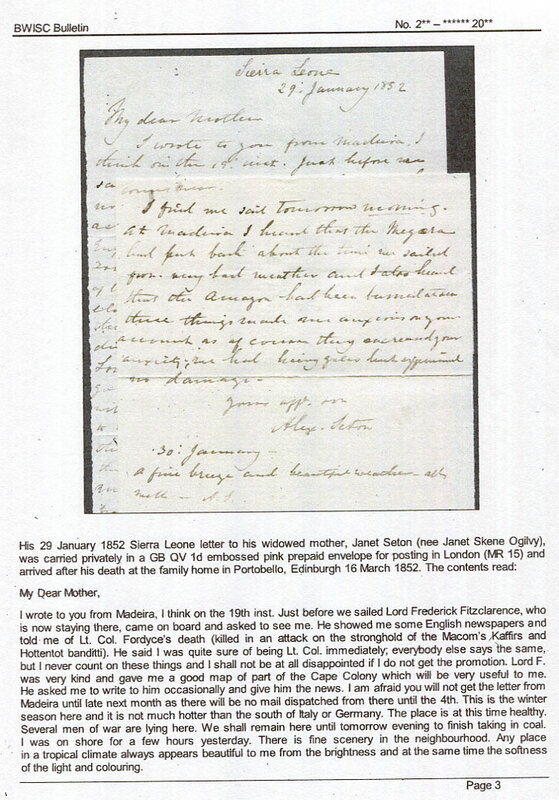 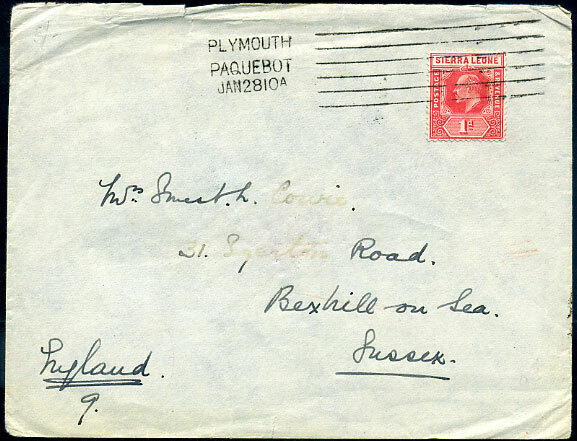 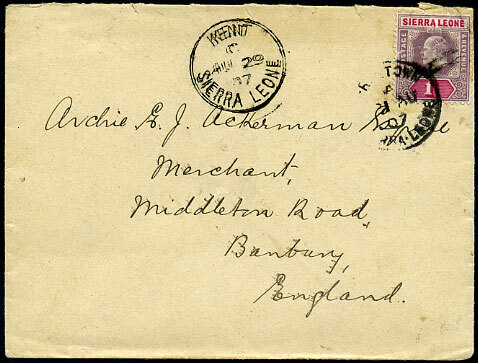 oval dated 12 JU 42 on censored cover to Old Hill, England. 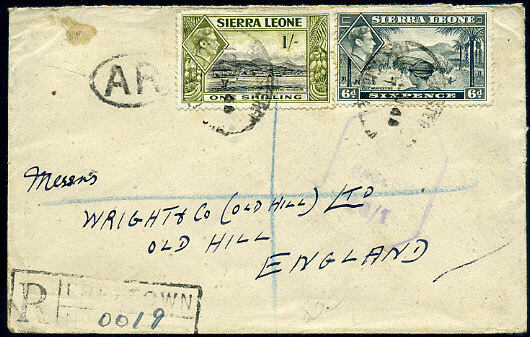 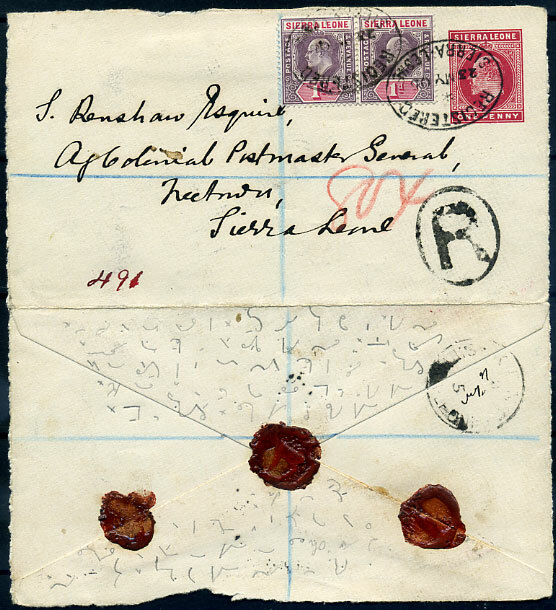 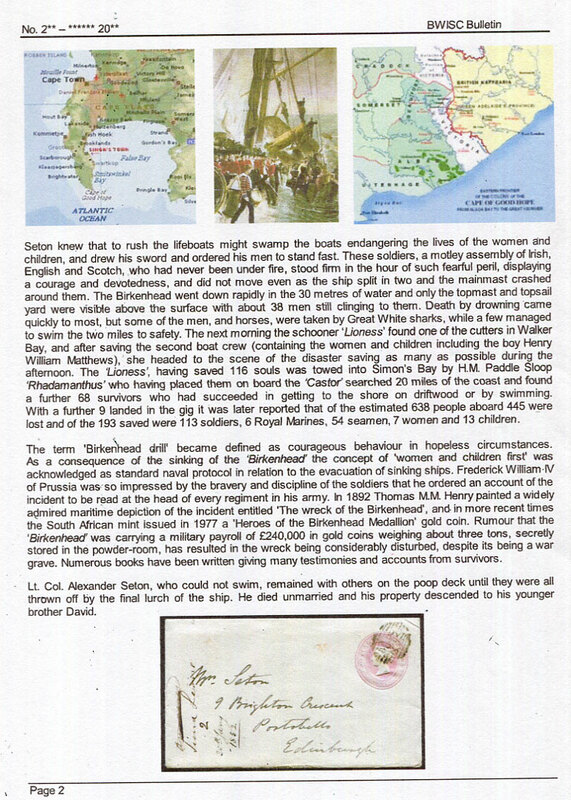 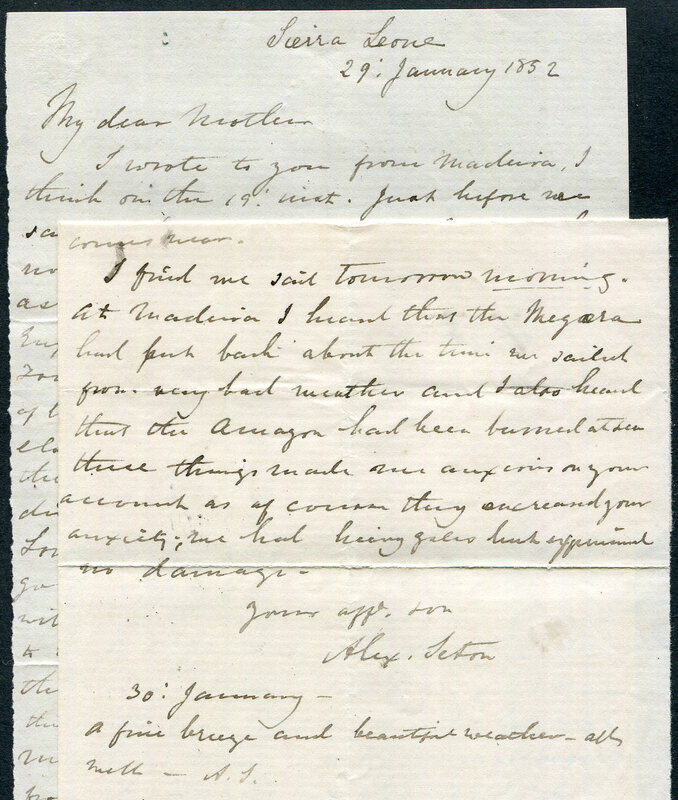 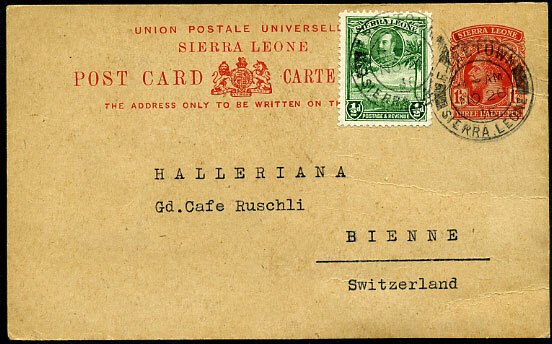 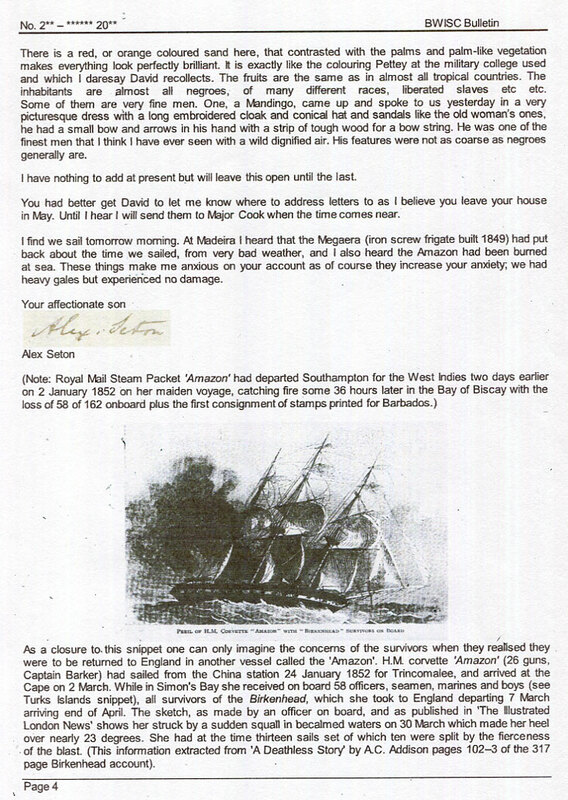 (073.01) weak backstamp dated 21 May 5 (part manuscript) on KE7 1d PSE with added pair KE7 1d (SG.74/87) tied REGISTERED ovals dated */23 MY 05 to S. Renshaw, Acting Colonial Postmaster General, Freetown, opened out for display. 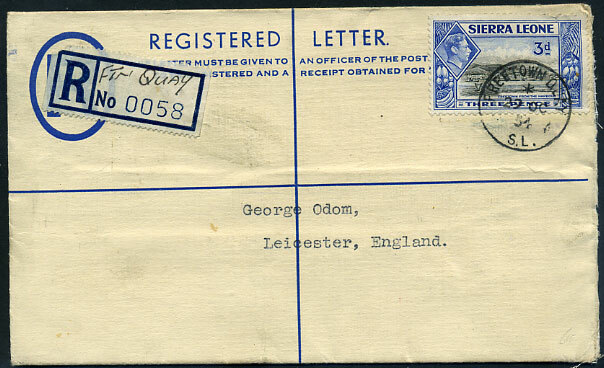 (035.81) */29 OC 54 on KG6 3d added QE2 4d red-brown PSRE to Leicester. 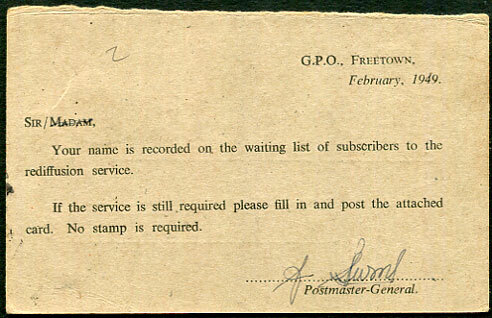 (016.01) */NO 6 09 alongside design KE7 1d PSE pmk'd Freetown A/9 NO 09 to R.C. 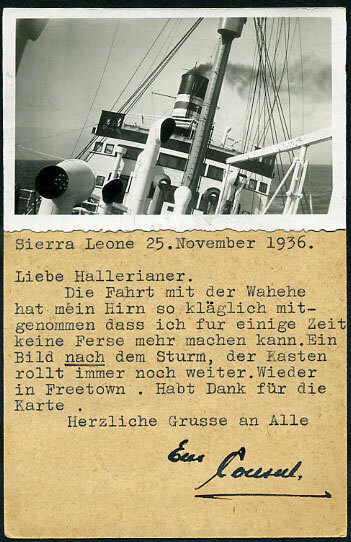 Mission, Freetown. 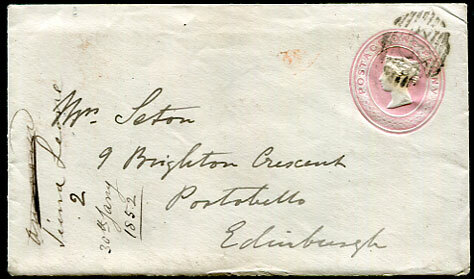 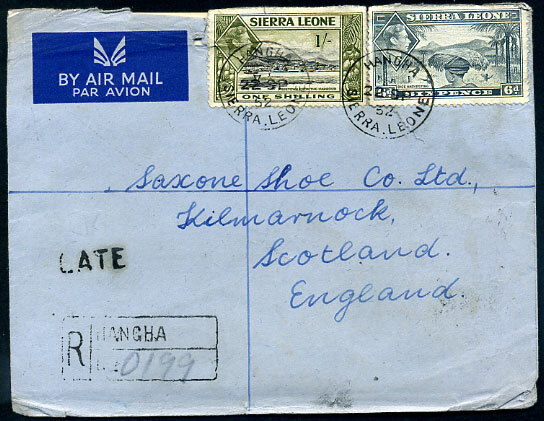 alongside KG6 6d, 1/- pmk'd HANGHA 22 SP 52 on cover to Kilmarnock, boxed HANGHA reg. 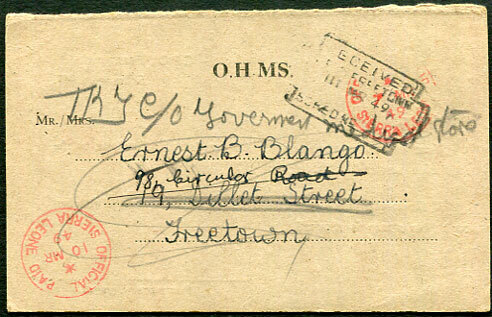 h/stamp, b/stamped GPO reg. 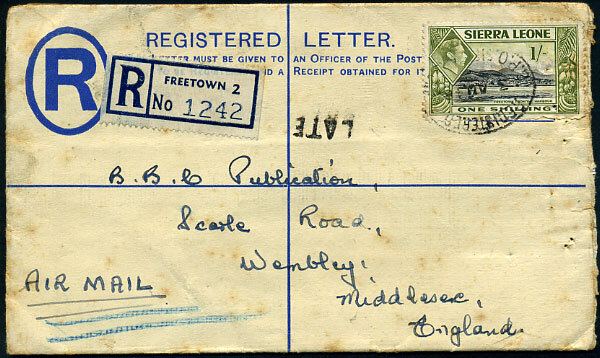 oval 24 SP 52.
alongside KG6 1/- added PSRE (flap cut away) pmk'd GPO 3 AU 48 to Wembley, Middlesex, blue FREETOWN 2 reg. 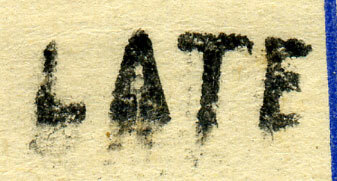 label, toning. 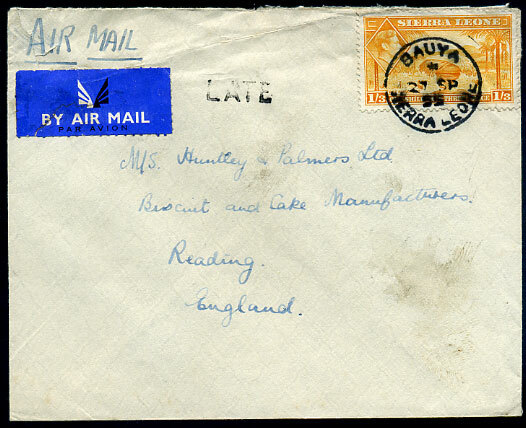 alongside KG6 1/3d pmk'd BAUYA */27 SP 55 on cover to Huntley & Palmers, Reading, some soiling. 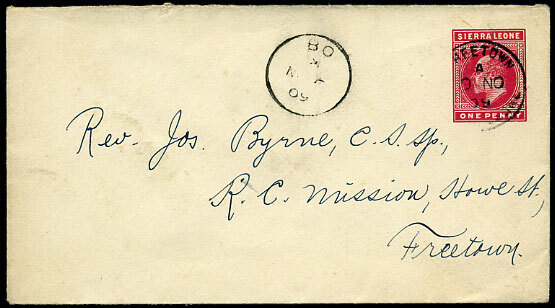 Reverse sender's address c/o S.L. 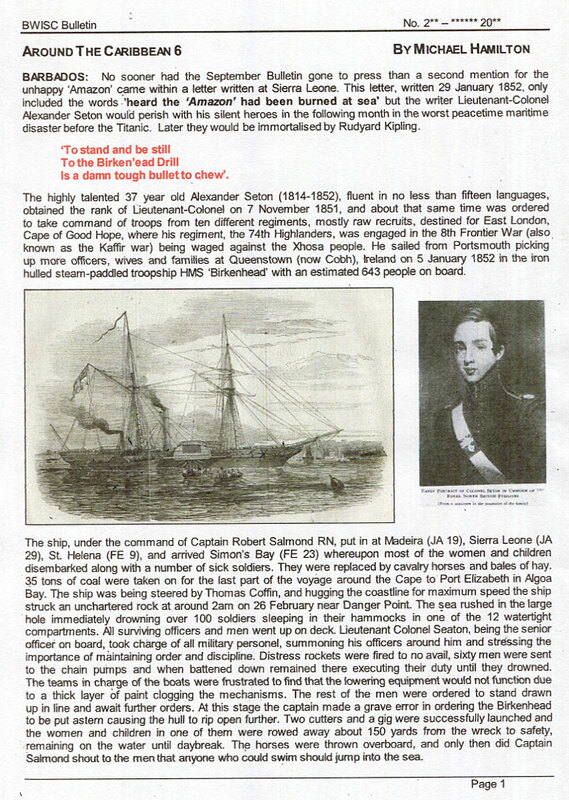 Rlwys Bauya.